Water filters from THE well water filter experts. Custom American Made-Factory Direct to your door! Budget prices-SAVE money. Water Filters, Water Softeners, Iron Filters and Well Water Treatment Systems. Water filters that are American Made and American Based Support 7 days a week. Additionally, this site is a complete guide for premium quality filters of all types. And home water filtration systems as well. Also remember that we are THE well water experts. Furthermore, we feature only the USA's best budget water filters, water softeners, iron filters and water conditioners. Therefor, our well water filters, sulfur filters, odor removal systems, drinking water filters and reverse osmosis systems are the best money can buy. But at an affordable budget friendly price. Also, our phones are answered 24/7 by real humans. So give us a call at 800-684-0979 to speak with a friendly expert. And our knowledgeable water techs are not allowed to ask you to buy anything or pressure you in any way. Above all we just answer your questions and give you a "soft place to land"... So call us and see how helpful we truly are. And we are a great resource for the DIY "do it yourself" homeowner. Or for the person who wants everything done for them. So there is NO NEED to ever have a slick talking water filter salesman come into your private home again. FREE water testing, test kits, well water filtration systems, such as irrigation filters and lawn sprinkler water filter systems, at LOW wholesale prices. And we also sell EVERY type of specialty filters for other unwanted contaminants. For instance: arsenic removal, nitrate removal and tannin removal filters. If you don't see the water filter you want here, just ask us. Because or experts will make it for you. Additionally, remember we have anything that anyone sells. As long as it actually works. We have over 4,000 different filters we make. We custom make the filter to fit exactly the type of water you have. In addition, every custom water treatment system we sell is made with only the best NATIONAL NAME BRAND COMPONENTS. And only from AMERICAN BASED SUPPLIERS. Our home water treatment systems replace ALL major brands. Similarly, we also sell all types of commercial and industrial water filtration systems. 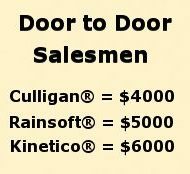 And we replace Culligan®, Kinetico®, RainSoft®, Ionics®, Hague®, Cuno®, Water-Right® and all other home water treatment systems as well. Our promise at Water Filters of America™ is to be honest and never sell you more than you need. Everyone needs a soft place to land without the confusing and conflicting information you see online about water softeners, iron water filters and other types of private well water treatment systems. We keep things simple and easy to understand. We have water treatment systems for city water too. Our friendly water techs will never ask you to buy anything and they do not work on commission. Their job is to help you get it right, even if you never buy anything. Furthermore, they will never pressure you in any way. And we will never send a sales person into your home. That is never a good idea. Get free advice and free water testing here. If you buy a water softener or water filter from us and follow our advice, we guarantee it will work perfectly or your money back. 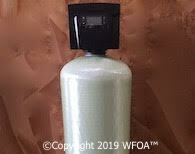 If you have had a water softener or water conditioner sales person in your home trying to sell you overpriced water filtering equipment for thousands of dollars. Additionally, if you have a private well water system full of iron, sulfur, manganese or other unwanted problems. We are the place for you. Because sell a wide variety of water conditioners and water filtration systems that are all made for exactly the kind of water you have. Because everything we make is custom made to order to fit exactly the type of water you have. Most noteworthy is our Premium Quality components and equipment offered at budget prices. Additionally, we have everything you can imagine to treat any type of water. Whether you are in a private home. Likewise if you have the needs of a commercial water filter. Also, we don't believe one size fits all. Information is the key. We have all the information you need on this website to correctly decide what type of water filtration method is best for you. Since we sell almost every type of home water softener or well water filters that are available on the market today, we know what the best solution is for you. For example: if you needed an iron filter for a bad rust problem in your water. Most companies will sell you the same filter or water softener no matter what your situation is. We would never do that. In addition, every unit we sell is custom made for your type of water. And we can easily help you determine what the facts are. So that you get the right type of solution to fix your exact water problem. Furthermore, most companies have only one type or brand of water softeners or water filters. So we have almost every type and style of top brand water softener or filter sold on the market today. In addition, the one we might use on a home with city water may be ENTIRELY different from one on a private well. So can you see why we say: "One size does not fit all people's water problems"? So, not sure where to start? Contact us by phone or email or you can chat with us right here online. No matter how you contact us, you certainly should get all of your budget water softening and water filtering advice here. Conscequently, even if you never buy a thing from us. We will help you. And remember, we are the good guys. As a result, we will treat YOUR family like OUR family. Lifetime Warranty for Tech Support Privileges. Never a Fee for Helping You. Above all, we have American made water treatment systems and supplies direct from the factory. Delivered to your door FAST. Nationwide. High quality budget priced filters. And great warranties. And we have every type of water treatment systems and water purifiers imaginable. Furthermore, we have complete, whole house home Water Treatment Systems from $399.87. And Water Softener and Water Conditioner bargains from $299.87. Reverse Osmosis Systems (RO systems) from $199.87.Drinking Water Filters from $29.87. And Rust Filters and Iron Filters from $499. And we have Counter Top Filters from $69.87. Water Coolers from $279.87. Additionally, we have Sediment Filters from $49.87. And we have Sulfur Filters and odor removal filter systems from $398.87. Iron in well water? Many people call iron water rusty water. And some of the terms we hear in this regard are rust filters or rust water treatment systems. Furthermore, we consider all rust removal filtration system applications to be the same as iron water applications. And you should virtually never remove iron or rust with a water softener. In addition, every unit we sell is custom built to order. And we use only the finest national name brand components available on the market today. Above all, we have Premium Brand Equipment at Budget Prices. Don't forget to save this page to your Favorites! Questions, comments and feedback Here. PLEASE NOTE: All units sold upon approval only. And prices and shipping subject to change. Some assembly is required on most purchases. And Water Filters of America™ is not responsible for source water changes or misapplications. Also note: All home water treatment systems come complete. In addition, all backwashing water softeners and water filters include a full 7 year electronics warranty. For instance: high grain softeners, water conditioners, iron filters, sulfur filters, odor filters, well water treatment and filtration systems. In addition, drinking filters and reverse osmosis systems include a full 2 year warranty. Soft clean luxurious water for just pennies per day. To clarify, purchasing anything on our website means you agree to abide by our terms of service. Above all we can not guarantee ANY applications where our advice or recommendations are not followed exactly.